As if waiting for summer, when most people are thinking of resting from their daily drudgery of work, this week has seen a wave of attacks on trade unions across the region. News has today come from Belarus of a major attack on the Independent Union of the Radio-electronics Industry and Confederation of Independent Trade Unions of the Republic. Police broke into their office, conducted a search and removed all the computers and memory devices, while taking Gennadii Fedynich – President of the IURI and Alexander Yaroshyuk – Head of the CITUB, along with others in for questioning. Allegedly the Trade Unions have failed to pay taxes, but all activists understand that this is because the trade unions placed themselves at the head to the huge protests earlier this year against the “Tax on Parasites (unemployed)” (see http://socialistworld.net/index.php/international/europe/70-russia/7921-russia-belarus-a-week-end-of-mass-protests). In authoritarian Kazakhstan, the latest round of attacks on trade unions has come to a head. In a year in which over 400 trade union organisations have been shut down by the regime, this week the court in Shimkent, South Kazakhstan sentenced Larisa Kharkova – Head of the Confederation of Independent Trade Unions of Kazakhstan – to a four year suspended sentence, a confiscation of personal property (including her flat), a five year ban on trade union activities and, most humiliatingly, 100 hours of public work a year. Her crime – according to the prosecutor – the misuse of powers, but in reality this was pay-back because of her public support for the hunger strike by over 700 oil-workers in Mangystau in January. Larisa Kharkova has demonstrated remarkable courage in standing up to the regime. Just weeks before her trial she was visited by two persons claiming to represent the “President’s administration” offering her a reduced sentence if she pleaded guilty and handed over her trade union membership to persons deemed more suitable, i.e. them. This she refused to do as it would have led to charges against other members of her union. As it is, the Deputy President of the CITUK – Nurbek Kushakbaev – was in April sentenced to 2.5 years in prison and in May, the head of the oil-workers’ protest – Amina Yeleusinova – was sentenced to two years. The most brutal attack occurred last night (2 August ) in Moscow. 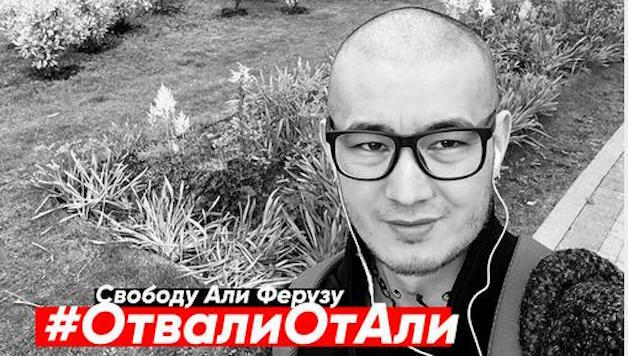 Ali Feruz – whose real name is Khudoverdi Nurmatov – was sentenced by a night time court to be deported to Uzbekistan. Although he has ten days to appeal, he has to spend this time in a new prison for foreigners in Moscow – rapidly gaining notoriety as the Russian Guantanamo. Although born in Uzbekistan, Ali grew up in Russia, his parents and siblings are all Russian citizens. He went to study in Uzbekistan and while there reported on the authoritarian nature of the then Karimov regime. He was arrested, badly tortured and pressured into becoming an agent for the country’s security services, which he refused. He fled back to Russia, then for a period had to devote himself to rehabilitation after his torture. He applied for asylum but was turned down. Since he has returned to Russia Ali has worked as a journalist on the opposition paper “Novaya Gazeta”. In that role, apart from being openly gay, he has fought against any attacks on human and democratic rights, has helped to expose how conscript soldiers are bullied and how the army covers up the deaths of contract soldiers. His main journalistic work has been to expose how badly migrant workers are treated and how national groups are discriminated against. He has worked closely with members of Socialist Alternative in establishing the Independent Trade Union of Journalists, which also played a major role in exposing the brutal attacks on the LGBT community in Chechnya. As he was walking down the street outside the office of “Novaya Gazeta” in Central Moscow yesterday he was stopped by police for a document check – clearly pre-planned – detained and taken to a specially convened court sitting in the evening. He was charged with being in Russia illegally. Members of Socialist Alternative (CWI Russia), despite threats and intimidation, immediately established a “one-person picket” outside the court. This is the only form of protest still legal without official permission in Russia. Even then the police tried to stop it as they claimed a placard that was handed from one person to another showed it was an organised group! Only state approved journalists were allowed into the court itself. When the decision to deport Ali back to Uzbekistan was announced at one-o’clock in the morning, he was so desperate he tried to cut his veins with a pen. Fortunately, his lawyer stopped him. The significance of this case is demonstrated by two facts. Firstly, Ali’s hearing coincided with that for a group of armed bandits taking place on the other side of Moscow. They staged an escape which ended up in a gun battle and four dead. The police had only sent four police vans to that trial but eight to Ali’s. But more importantly, over two thousand people have been arrested in Moscow and St Petersburg for political activities this year, at least three hundred have spent two weeks in police cells. But there has been no organised protest, mainly because none of those arrested have had organised support – this has allowed the regime to think they can get away with their authoritarian methods. But in Ali, there is a person who has been a conscious opponent of the regime, an active and respected journalist who has worked closely with members of Socialist Alternative to establish the Independent Journalists trade union and who, despite threats and torture, has not compromised with the regime. Friends and Socialist Alternative activists were still outside the court at one o’clock last night and today, 3rd August, dozens, if not hundreds, are expected to turn up at further protests. Send messages of support to Ali at alisolidarity12@gmail.com. The Independent Trade Union of Journalists, Russian Amnesty International and Novaya Gazeta are all supporting Ali. Please send information about any actions to robert.cwi@gmail.com. Previous article#Occupy Trumpcare: Cincinnati Socialist Alternative keeps up the pressure!